Christmas is just a week away! Christmas is almost upon us once again! Our Christmas Eve Service this year will be at 8:30pm, and will include a living nativity, much carol singing, a beautiful offering from our joint choir under the direction of Pat Middlin, and a concluding candlelight service. We invite you and yours to join us on this blessed and Holy night, as we once again tell the story of when our Eternal God entered our world as helpless baby Jesus. Here is your December Newsletter! Have a blessed Advent and Very Merry Christmas! 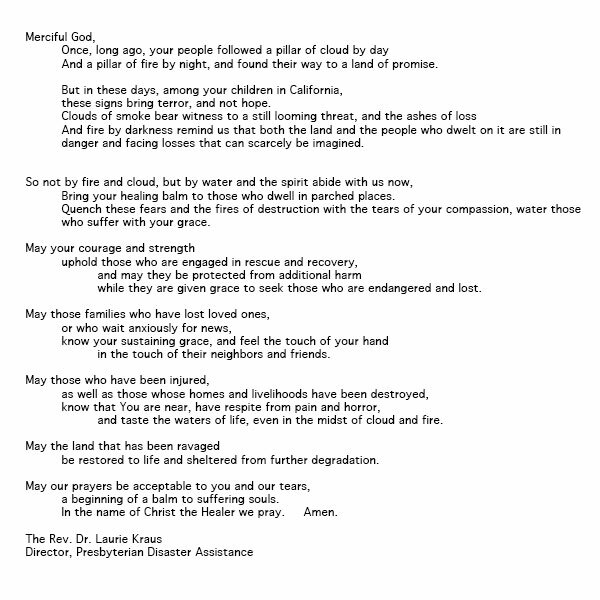 We know that your hearts, like ours, have been broken as the devastation wrought by wildfires in California continues to increase in severity. In addition to the destruction of land and forests, the cost to lives and human community has been unprecedented, and those costs are still rising. The town of Paradise has been leveled; more than 80 people have been confirmed dead at this writing, and thousands more are unaccounted for. In Northern California, families are living in tents and having difficulty accessing basic services; many of those who have lost their homes are older than 60. While the focus is on those closest to the fires, the impact is widespread. Due to the smoke, communities hundreds of miles from the fires are being impacted by unhealthy air quality. What’s more, after the wildfires there is an increased risk of mudslides. Through Presbyterian Disaster Assistance (PDA), the Presbyterian Church (U.S.A.) has been present since the beginning of the disaster. Working closely with leadership in the affected presbyteries, we have released emergency grants to support the presbyteries in meeting the urgent needs of their neighbors. At the request of the Red Cross, PDA has deployed four disaster spiritual care providers from our national response team to work directly with survivors in shelters and the affected communities. We are deploying additional PDA teams to support the presbyteries in their assessment and response as they help their neighbors begin recovery. Additional grants for ongoing emergency support for survivors and long-term recovery will be forthcoming. 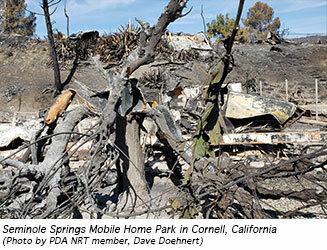 Your gifts to DR000165 (U.S. Wildfires) will ensure that PDA has adequate resources to support the recovery. Gift of the Heart kits are a hands-on way to help others and a fun project for the Advent season; hygiene kits and school kits will especially be needed in California. You can also share this bulletin insert in church on Sunday. Community Thanksgiving Dinner November 18th! Please join us for this always-uplifting time! Dinner @ 4:30 and service @ 6:00. This dinner is a potluck. If you wish to bring a dish to pass, our church has been asked to bring hot or cold vegetables. A Joint Community Choir will be offering their talents. Secondly, here is your link to the November Newsletter! Our Wednesday night parables study continues tomorrow night at 6:30 at the manse. We will be getting to know Jesus’ parable of the seeds (aka the Sower). If you did not sign up you are still welcome, the sign-up was only for scheduling purposes. Also, if you have been interested but the scheduled night does not work for you I have had inquiries about a possible afternoon study; if you are interested in that please let me know and we can make that happen. Hope to see many of you there as we gather around the word of God together! Hi Everyone: just a reminder that our parables study begins tonight at 6:30 at the Manse (call or text if you need more detail; 989-780-2813). This will be Every Wednesday through Dec 12th, with Thanksgiving week off. Whether you signed up or not, you are welcome. Nor is this a study that one needs to prep for or make every week in order to keep from falling behind. Rather, each is a self-contained week focused on one of Jesus’ parables. Please be aware that our house will be partially “discombobulated” due to being in the middle of painting. It will still be fine to meet (no wet pain! ), but you may be enjoying the delightful smell of fresh paint. If that causes you issues please be aware. Please bring your bible, a notebook and pen if you need them, a curious mind, and an open heart! Happy Autumn! Click Here for the October Newsletter! Happy Labor Day! Please click the link below for the September Newsletter. Welcome to the Dog Days of Summer! Enter your email address to receive new announcements on our site via email.